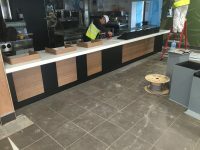 TA Knox have continued to support McDonalds UK with their large refurbishment programme throughout the UK and Ireland. During 2016 we installed over 150 new Corian and Joinery counters to their restaurants and hope to continue throughout 2017. 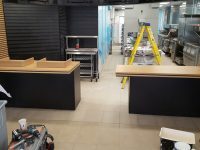 These counters consist of a MDF base with shelving, a Corian top with till surrounds and a Corian / Glass collection point. More recently the counters have been changed to laminated MDF Joinery counters. Project completed to time and budget as always.